!! एक पेज मेरे प्रिय श्री श्यामसुन्दर जी के नाम !! : Loving quarell between Suka and Sari about Shri Krishna-Radha : !! श्री शुक-शरी संवाद !! Loving quarell between Suka and Sari about Shri Krishna-Radha : !! श्री शुक-शरी संवाद !! Suka and Sari lovingly quarell about Youthful Divine Couple Shri Radhe Krishna. 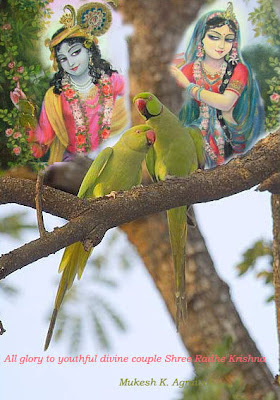 Once In Bahulavana , Sriman Chaityna Mahaprabhu saw a female and male parrot (Sari and Suka) sitting opposite each other on two branches of a tree, lovingly quarrelling about the glories of the Divine Couple, Shri Radha -Krishna..
Suka: "My Krishna is Madana-Mohana, the enchanter of Cupid’s mind." Sari: "Yes, He is – as long as my Radha is at His left side. Otherwise, He is only Madana (Cupid)." Suka: "My Krishna lifted Giriraja (Govardhana) on His finger." Sari: "Because My Radha transmitted power into Him; otherwise, how could He have done so?" Suka: "My Krishna head is beautifully decorated with a peacock feather." Sari: "Only because my Radha’s name is marked on that feather." Suka: "The peacock-feather on my Krishna’s head leans to the left." Sari: "Because it wants to bow down to my Radha’s feet." Suka: "My Krishna is the life of the mother Yasoda." Sari: "My Radha is the life of that life, otherwise Life is empty." Suka : "My Krishna is world's wish fulfilling jewel." Sari : "My Radha is the giver of prem and Krishna Knows." Suka : "My Krishna plays the flute." Sari : "True its calls only Radha's Name. Or we wouldnot have it." Suka : "My Krishna is the Guru of the world"
Sari : "My Radha is a wish fulfilling tree 'Kalptaru', otherwise who is Guru?" Suka : "My Krishna is the begger of Love." Sari : "My Radha is the waves of Love"
Suka : "My Krishna stays under Kadamba tress"
Sari : " Only because my Radha comes and goes, or he would not stay"
Suka : "My Krishna is Black of the world"
Sari : "My Radha is the world's light, otherwise that black would not be seen." Suka : "My Krishna is Shri Radha's servant". Sari : "True, the flute is a witness, otherwise He'd be a mendicant". Suka : " My Krishna is the life of the world." Sari : "My Radha is the sweet breeze, which without life cannot remain"
Sari : "My Radha gives life, otherwsie life would not remain"
Suka: "My Krishna is the moon." Sari: "My Radha is the trap that captures that moon." Suka: "There is no need to quarrel uselessly. Let us filled with love now chant Hari Hari and go off to Shri Dham Vrindavan and there glorify the Youthful Couple together." Sari: "I happily agree to this." After hearing the parrot’s loving quarrel, Sriman Mahaprabhu watched the dance of the peacocks. Seeing their bluish necks He remembered Krishna and became so overwhelmed in ecstatic love that He fell down on the earth in a faint. !! राधे राधे गोविंद गोपाल राधे ! !